If a portable flight recorder is topping your list for Santa, do not miss the December-January issue of S&G, where you can also see some stunning vintage photographs from the VGC International Rally. Read about a comp with just one task – a 2,400km round-Europe safari, see the annual round-up of results and ratings, and discover how you can continue to develop your cross-country skills. Gliding has come a long way since the days of turn point cameras and smoking barographs to prove where you’ve been and how fast you got there. Today downloading and submitting your flight has become very simple with USB/SD devices. Shaun Lapworth takes a look at the new generation of independent battery-powered flight recorders. If you’d like to improve your cross-country performance, see the final article in the three-part Ask the Coachfeature Learning How to Go Faster. Leading coaches Kevin Atkinson and Bernard Eckey discuss how to adaptspeed-to-fly methods with Tony Cronshaw, with some top tips on STF in headwinds and tailwinds..
Jeff Warren and Bernie Morris put their performance to the test with an amazing 2,400km round-Europe safari. They took part in Euroglide, a biennial gliding race over more than 2,000km through several European countries, flown as quickly as possible. Having flown through six countries in five days – in varied conditions over some spectacular terrain – Jeff describes the experience as “unique and rewarding”. Another rewarding event for contestants was the 42nd VGC International Rally, held in Denmark. Our cover shows Jim van Aalst flying Graham Saw’s Petrel, beautifully photographed by Ole Steen Hansen. There are more stunning photographs, by Ole Steen Hansen and Alexander Gilles, in the centre spread feature. Also in this issue: Charlie Jordan reports on a fiercely competitive Junior Championships. There’s another tale from Down Under, as ex-London GC member Mark Dalton describes how he gained a valuable gliding insight from a large green amphibian. Geoff Martin learns some valuable lessons during an eight-hour ‘Compass’ flight. Dave Hope describes how Black Mountain’s members are going further and faster with a BGA initiative. Annie Robinson reports on a Derby & Lancs event to inspire more women to join the club. 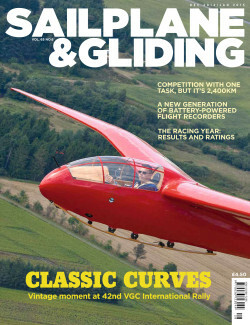 Max Kirschner looks at the impact of new technology on world and European gliding. Development Officer Alison Randle encourages clubs to look beyond the perimeter fence and build relationships. Pete Stratten reports on EASA’s 2018 extension. Keith Wilson looks at how a scholarship scheme transformed Nene Valley Gliding Club into a vibrant part of the community. Plus, there are many more of your stunning images in the Gallery pages. Shaun Lapworth looks at the new generation of independent battery-powered flight recorders that could be topping your list for Santa this year. Tony Cronshaw discusses how to adapt speed-to-fly methods with leading coaches, offering top tips on STF in headwinds and tailwinds for up-and-coming cross-country pilots. Numbers were up again at a fiercely competitive Juniors, with some promising new talent. Charlie Jordan reports. Jeff Warren and Bernie Morris experience 2014’s Euroglide. It’s a comp with just one task, a round-Europe safari from Eindhoven, flown as quickly as possible. Mark Dalton gains a valuable gliding insight (from a large amphibian) in an unexpected situation. Geoff Martin flies 510km cross-country with Roy Pentecost and learns some valuable lessons during an eight-hour trip. Dave Hope reports how Black Mountain’s members are learning to go further and faster with a BGA initiative. Annie Robinson reports on an open day held to inspire more women to join Derby & Lancs. VGC members from around the world met in Denmark for seven days of fun and flying at the 42nd VGC International Rally, Arnborg. Bruce Stephenson reports. Max Kirschner looks at the impact of new technology on world and European gliding championships and whether the benefits outweigh the negatives. Four pages of BGA-rated UK competition results and the provisional 2014 ratings list. BGA Chief Executive Pete Stratten reports on EASA’s 2018 extension. Keith Wilson reports on the project that has transformed Nene Valley Gliding Club from sleepy hollow to a vibrant part of the community. BGA news; your letters; Gliding Gallery; obituaries; Club Gallery; Club Focus – Yorkshire; club news; BGA badges; incident and accident summaries.